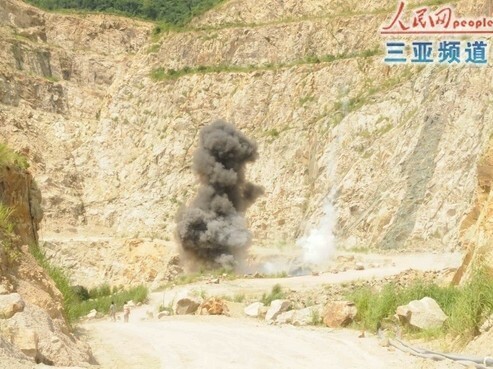 35 unexploded ordnances were discovered near Sanya Qiongzhou College last Sunday afternoon by a worker of a construction site who immediately notified authorities, reports 0898.net. To ensure the safety of surrounding residents, local police responded to secure the area and immediately contacted the explosive specialist to inspect the device. Members of the explosive team arrived on the spot at 23:00 pm on that day and continued to dig out another 26 ordnances. 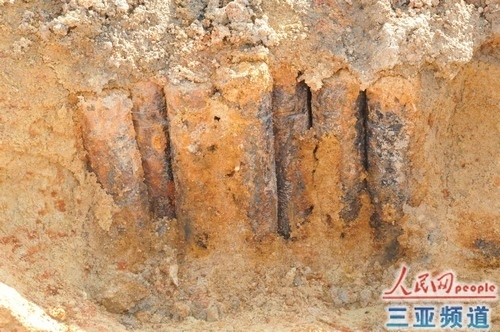 The 9 ordnances, with sizes ranging from 20 mm to 40 mm, were rusty on its surface and suspected to be used by the Japan military during WW2 and buried under the ground. To dispose of them in an efficient manner, the objects were moved to a discarded location in Lizhigou Area and were destroyed successfully on Monday. To eliminate the remaining fire risk of undiscovered ordnances, the construction site has been closed for further investigation. Residents who find any object like this are also warned to alert police immediately and do not attempt to handle it.